Jason and his crew came into our woods in November 2017. We were nervous about having the woods logged because it is unusually beautiful and pristine. We were pleasantly surprised. 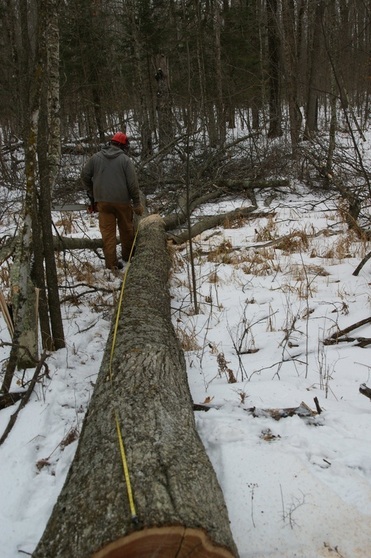 Jason did an excellent job of select cutting being very careful not to damage other trees. The woods needed cutting and now looks great! Jason and crew were very professional and great to work with. We would highly recommend them. My name is Jeane Myzka. I live on a certified organic dairy and beef farm in northern Wisconsin. I also hold colt starting and horsemanship clinics throughout the year. I am an avid student of Ray Hunt Horsemanship which means when it comes to horses and people.... " the humans is responsible to make the horse confident in its job." I just wanted to thank you for the excellent job of logging on our McGrath, MN forty with your Brabant Belgian horses. This forty acres was a mature oak forest when we purchased it from a family friend in 1970. Over the years we have been offered many thousands of dollars by area logging companies for the timber. After seeing the destruction of some adjoining lands logged off by commercial loggers, our family said no. You cut only the very mature oak trees and allowed trees to grow that need another twenty years to mature. Then our children can do this again, rather than waiting a hundred years for the whole forest to mature again. What really impressed us is the way you opened up areas in the forest to allow sunlight in to rejuvenate the forest floor with new growth. We look forward to seeing much more wildlife activity. Thank goodness for guys like you who love horses and do a marvelous job of sustaining a forest.